WIN prizes and support International Womens Day; it couldn’t be easier! Today I want to tell you about the Pink Shoe Power Prize Draw that I’m supporting to celebrate women and the launch of the ground breaking eBook Pink Shoe Power, Discover Your Time Management Style for Success in Business & Life. AND I would love you to win some gorgeous prizes…. The thousands of $$$$ worth of prizes include a beautiful Swarovski crystal necklace, a busy woman’s weekly planner pack , a virtual home organizing pack, pretty and fun bling stationery, natural skin care, a social media starter pack, psychic business coaching, a medical intuitive consultation, a sensational pool design consultation and a book of inspiring business women. Impressive, don’t you think! PLUS, as a special gift to celebrate the launch, you have access to a fantastic tool – the Pink Shoe Power Profiler. You will discover your Time Management Style so you can understand why you manage your time the way you do and get some great tips to help you. It’s simple, fun and free to you! Given that time management is one of my key sweet spots for all things entrepreneurial mother, I cannot recommend the use of such a profiler highly enough. Besides which, it is FUN. Once you have completed the Pink Shoe Power Profiler you will be automatically entered into the prize draw. The competition will be launched on International Women’s Day, March 8th, with the winners announced on 31st March. You can enter now so you don’t miss out. Plus we have some special bonuses and discounts for you, which are exclusive to those who register for the competition. 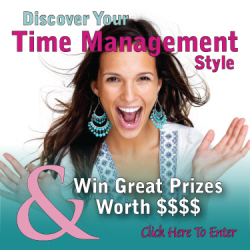 To enter, click here and get your Time Management Style and your name will be automatically entered.